Forty years after Neil Armstrong made his historic first steps on the moon, Apollo 11 is beginning the same trip to the lunar surface this week via the internet. The website WeChooseTheMoon.org was launched today, sponsored by the John F. Kennedy Presidential Library and Museum to recreate the lunar mission minute-by-minute as it happened back on July 20, 1969. 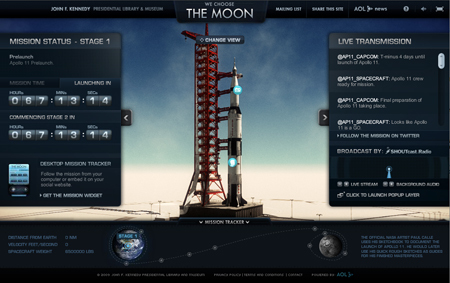 Using archival audio, video, photographs, and computer-generated animation, the site will let space fans experience the four-day trip to the moon's surface beginning with the anniversary of Apollo 11's launch this Thursday. The site will also feature "real-time" transmissions between the astronauts and NASA flight controllers that can be followed both on the site and through Twitter. "The undertaking is pretty massive. We're joking a lot about how sending millions to the moon in cyberspace in 2009 is going to end up taking just as much time as sending three guys to the moon in 1969," said Joe Alexander, creative director at the Martin Agency who set up the site. The web site will sport 44 archival videos, over 109 hours of audio transmissions streamed "as they happened," 11 mission-critical events rendered in computer animation, 400 NASA photographs, and 700 tweets with real-time transmission excerpts. The website's name is coined from a speech former US president Kennedy gave in 1962 when he said, "We choose to go to the moon in this decade and do the other things, not because they are easy, but because they are hard, because that goal will serve to organize and measure the best of our energies and skills, because the challenge is one that we are willing to accept, one we are unwilling to postpone and one which we intend to win."